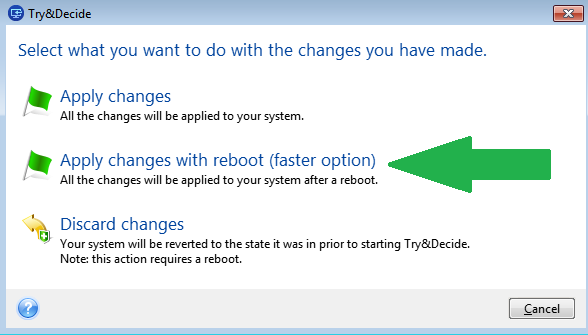 This article provides information on how to troubleshoot issues with Try&Decide feature. 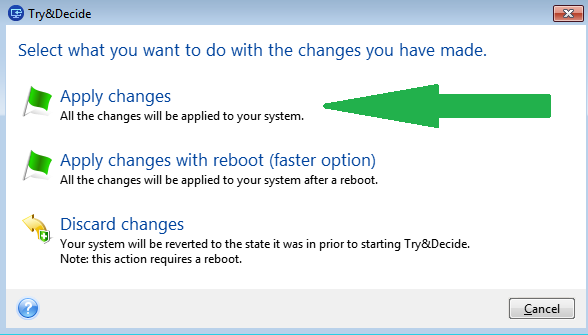 If you have Boot Order Lock or a similar boot order protection feature on your computer, disable it before using Try&Decide, as it can interfere with the software's ability to take actions after reboot. Note that Try&Decide cannot be used for protecting dynamic disks. GPT disks are supported by Try&Decide only on UEFI-booted Windows. Try&Decide can`t be used if there is at least one disk volume, encrypted with BitLocker, in the system. It does not matter whether this volume is intended to be used with Try&Decide or not. 1. Go to Start and search for “Windows Defender Security Center” or go to Settings > Update & Security > Windows Security > Open Windows Defender Security Center. 2. Click the Device Security icon in the Security Center, then click the Core Isolation Details link. 3. Core Isolation screen shows you whether Memory Integrity is enabled or not. To disable Memory Integrity, flip the switch to "Off". If the issue with Try&Decide persists, use instructions below to collect diagnostic information and contact Acronis Customer Central. a) open command line prompt "as administrator". Windows 8 and 10: right-click the Windows Start menu and select "Command Prompt (Admin)"
Windows 7: open Windows Start menu, type "cmd" (without quotes), right-click the found result and select "Run as administrator". Windows XP: open Windows Start menu, select Accessories and click on "Command Prompt". Click here to contact Acronis Customer Central with the collected information. If the issue is escalated to Acronis Development Team, a couple of other logs might be required. Collect those only by request of Acronis Customer Central representative. d) open the command prompt "as administrator"
e) switch to the folder with the downloaded Dbgview.exe using cd command, e.g. cd "C:\Users\UserName\Downloads"